Join us at First Draft Book Bar (the wine and beer bar inside Changing Hands Phoenix) for a discussion of this month's pick, Gail Honeyman's debut Eleanor Oliphant Is Completely Fine. Stop by Changing Hands Phoenix or Tempe (or order online by clicking "add to cart" below) to get your copy of Eleanor Oliphant Is Completely Fine for 20% OFF. 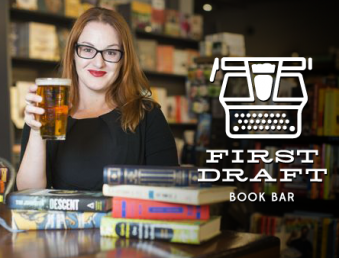 Then meet us and Arizona Republic reporter Barbara VanDenburgh at First Draft Book Bar to discuss the pick and enjoy HAPPY HOUR prices all through the event. Sign up for Barbara VanDenburgh's weekly "Feel Good 5" newsletter here, and join our First Draft Book Club Facebook group here. Smart, warm, uplifting, Eleanor Oliphant is Completely Fine is the story of an out-of-the-ordinary heroine whose deadpan weirdness and unconscious wit make for an irresistible journey as she realizes. . . The only way to survive is to open your heart.